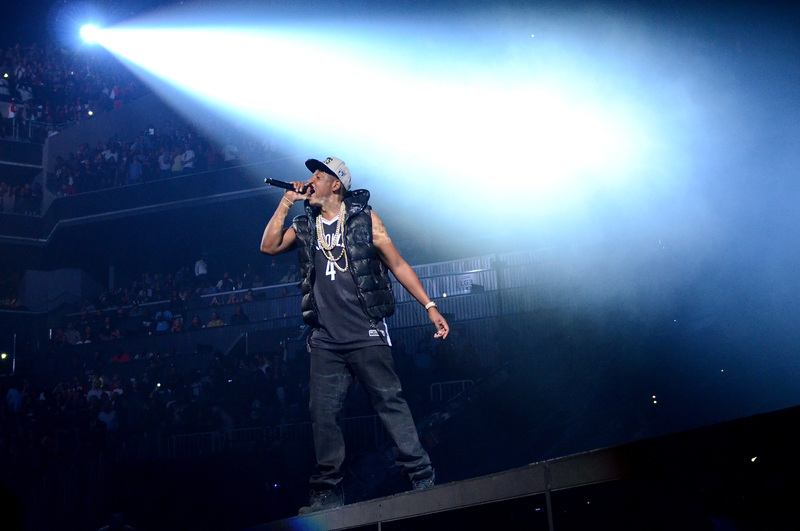 NEW YORK The newly built Barclays Center is the home of the Brooklyn Nets, and Jay-Z, an investor in the team, christened the venue Friday night in uniform, sporting a Nets hat and jersey as he rapped two dozen jams onstage in front of thousands. As he emerged onstage, a video highlighting some of Brooklyn's historical moments  like when it was named an official borough of New York City  played in the background. There were also pictures of famous faces who were born in Brooklyn, from Michael Jordan to Al Capone to Aaliyah to Adam Yauch of Beastie Boys. Another Brooklynite  Big Daddy Kane  made an appearance, performing songs like "Ain't No Half Steppin"' and "Warm It Up, Kane." He received a roaring cheer from the crowd when performing old-school dance moves with two dancers in all white. The audience was excited and wild, cheering on Jay-Z as blue laser lights beamed across the venue. A seven-piece band was placed a level above Jay-Z, who paced from left to right while performing jams like "Empire State of Mind," "I Just Wanna Love U (Give It 2 Me)," "Izzo (H.O.V.A. )," "99 Problems" and many others. Videos played on screens behind and above Jay-Z, while screens for fans in the higher sections  though not large enough  showed the rapper's performance on the left and right sides of the stage.